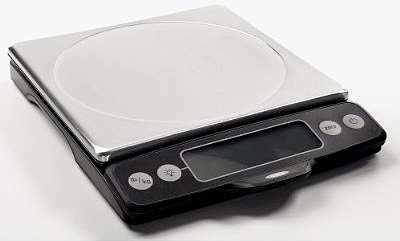 This is one of the kitchen tools that I can’t live without…the OXO Good Grips Food Scale. It has large, backlit, easy to read numbers and, with one click, switches from metric to U.S. (avoirdupois) weight. When you press the zero button (tare weight) to set the scale back to zero, you can continue to add ingredients and then zero it out again, so all your mixing and measuring can be done in one bowl. One of the best features is that the display can be separated from the base (it’s attached by a long wire) so even if you weighing a huge bowl or plate, you can still easily see the readout. If you bake, you know how important weights and proportions are to achieve a great result…this is the real deal!